His wins in the US Superbike Championship in 1981 and 1982 were commemorated by the much-prized Eddie Lawson Kawasaki Z1100R replica. Coming at such an early stage in his career this is a lasting testament to the impact he made in American domestic racing during the early 1980s. Suceeding the 'King' Kenny Roberts as the number one rider at Team Marlboro Yamaha was probably the hardest act in racing to follow. But Lawson's great drive and telent saw him through. His records speaks for itself, winning the all-important 500cc world championship in 1984, 1986 and 1988. 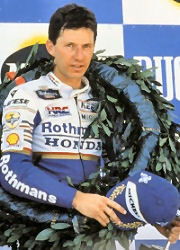 His forth grand prix crown in 1989 for Rothmans Honda made Lawson the only rider to win the world 500cc title in consecutive seasons on different machines. He signed for the Italian Cagiva team in 1990 for one of the biggest fees ever seen in bike sport. The Californian's win for the Italian factory at the Hungarian 500cc GP in 1991 was the team's first GP victory in 10 years. Factory boss Claudio Castiglioni was so pleased that he promptly gave Lawson a Ferarri Testarossa. Eddie Lawson retired from GP motorcycle racing at the end of 1992, to pursue a new career in American Indy Lights' cars.